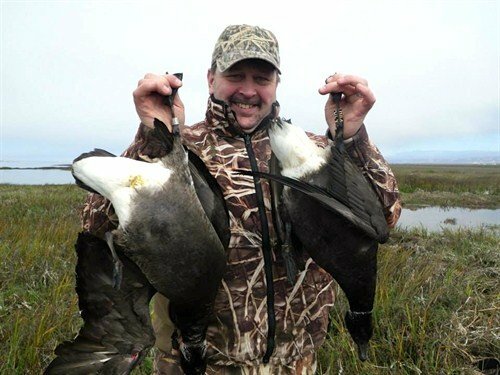 Pacific Black Brant hunting is a wonderful experience that’s perfect for avid waterfowl collectors or hunters looking to expand their wingshooting horizons. Pacific Black Brant migrate from the Gulf of Alaska and western Russia to Baja Mexico’s San Quintin Bay each year to feed on their principle food, eel grass, which is abundant in Baja’s rich wetlands. Pacific Black Brant accomplish an interested feat of flying non-stop 40 to 48 hours to their Baja wintering grounds. San Quintin Bay is about 13 miles long and 4 miles wide. Eel grass is abundant and winter weather is mild. About 40% of the reported world population of Black Brant, which is estimated at about 125,000, winter each year in this beautiful bay. The US Fish & Wildlife Service bands at least 20% of these birds. 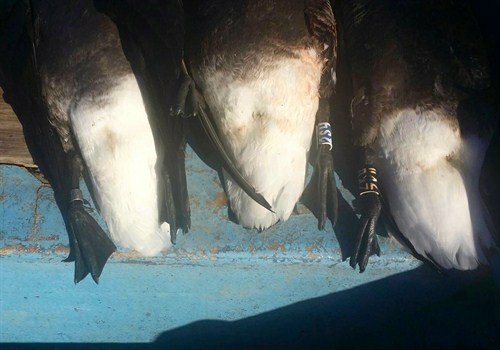 As an added bonus it is common for hunters to collect leg bands, and on rare occasions a Russian-banded brant is taken. Pacific Black Brant hunting seasons typically runs early-November through the last Sunday in February. Hunting is limited only to to Fridays, Saturdays, and Sundays until noon to ensure quality hunting for the entire season. Black Brant work best on a falling tide so productive hunting times vary in the mornings. The sights and sounds of whales, porpoises and a diversity of wintering shorebirds are common. 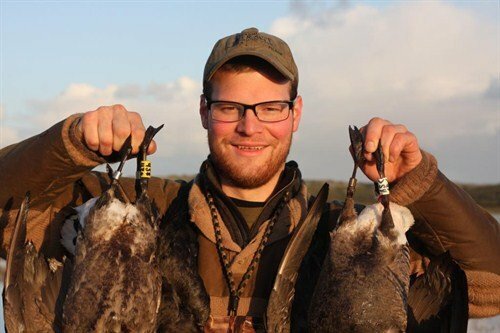 Complete success in collecting the current 8-bird brant limit is assured. Each morning, your personal guide will provide boat transfers to your eel blind along the shore, usually arriving at daybreak. Blinds are constructed of eel grass, camo netting, palmetto fronds or volcanic rock to blend in perfectly. A nice brant spread is set and the boat is retired to a safe distance. The staff maintains a kennel of apt retreivers and your retreiver is welcomed, so bring one if you wish. 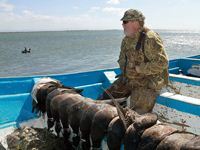 Ducks are uncommon and should be considered a rare treat while hunting Pacific Black Brant in San Quintin Bay. After limits are acheived, hunters return to camp for lunch and likely siesta. Hunters are lodged at the charming area hotels, and all meals are served at local restaurants and cantinas. Please Note: Afternoon options are limited to nonexistent. Duck hunting, quail hunting or light-tackle fishing are practically not available in Baja, but there is plenty of time for just simply relaxing. 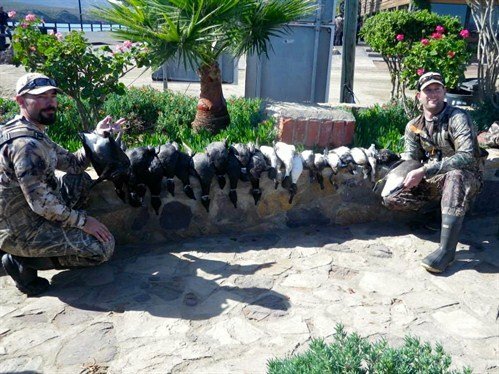 If you prefer a full-day hunting package to include ducks, brant, bass fishing, quail and dove hunting, see how this package compares to Mexico Black Brant Hunting in Obregon. 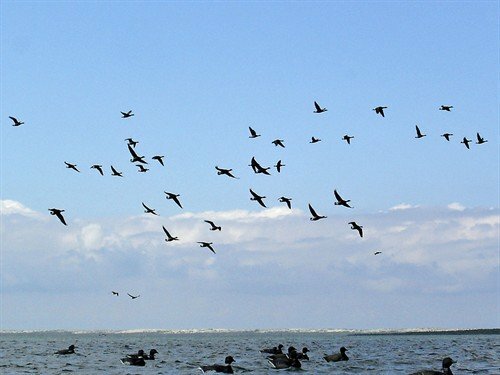 Black brant season runs early-November through the last Sunday of February, with peak brant concentrations usually occurring in late-January through February. $2,750 3-day Pacific Black Brant Hunting packages to include 3 morning brant hunts. Relax during the afternoons. $3,950 “Baja Blast” Brant Hunting Combo to include customized selections of among 2-3 locations for Pacific black brant as well as a combination of quail hunting (valley and/or Gambel’s quail), high-volume pheasants and dove hunting! Limited to select December and January dates only. Email or call for more information. 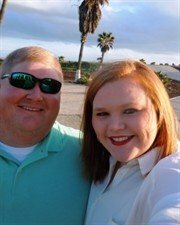 San Diego hotels, meals, etc. Pacific Brant (Branta bernicla nigricans), or Black Brant, are an abundant small goose of the ocean shores that breed in the high Arctic tundra and winter along the Pacific Coast. Over 70% of the world population of Pacific Black Brant winter in Baja, Mexico, with the much smaller remainder overwintering in interior portions. There are an estimated 115,000-150,000 black brant in the world and about 14,000 are taken each year by hunters. The highest numbers of Pacific Black Brant are shot in Baja, Mexico. Interesting fact: The oldest age record for any duck, goose or swan in North America is held by a Pacific Brant at 28.5 years! The Pacific Brant is slightly larger than a Mallard. Males are somewhat bigger than females; otherwise, the sexes are not distinguishable. It is one of the darkest waterfowl with a black head, neck and upper breast and a white necklace on the sides of the neck. The back and upper wing coverts are edged with lighter grays on a darker grayish brown feathers. The Pacific Brant has a very dark breast and belly with little or no contrast separating them. The flanks are much whiter than the Atlantic Brant. The black bill is short and stubby. They are an attractive addition to game rooms and are popular among collectors. Fly to San Diego International Airport (SAN). You will be met by our English-speaking representatives and ground transfered to hotel, about 6 hours south. Transfers occur on Thursdays, hunts are Friday-Saturday-Sunday mornings. SPECIAL NOTE – WE STRONGLY ADVISE ARRIVING ON THE WEDNESDAY PRECEDING YOUR HUNT AND OVERNIGHTING. PLEASE DO NOT PLAN ON DEPARTING SAN DIEGO ON SUNDAY NIGHT, WE SUGGEST OVERNIGHTING AND DEPARTING EARLY MONDAY MORNING. Clothing -Expect temperatures will average in the 60’s. However, frequent cold fronts can drop temperatures close to freezing. Outfit for mild temperatures with one set of clothes for cold weather (30 degrees +) in the event of a cold front passes. Orange cap recommended for Quail hunting. Bathing Suit – Bring one. Footwear – Light-weight boots are ideal for quail hunting. They should lace and have rigid soles. 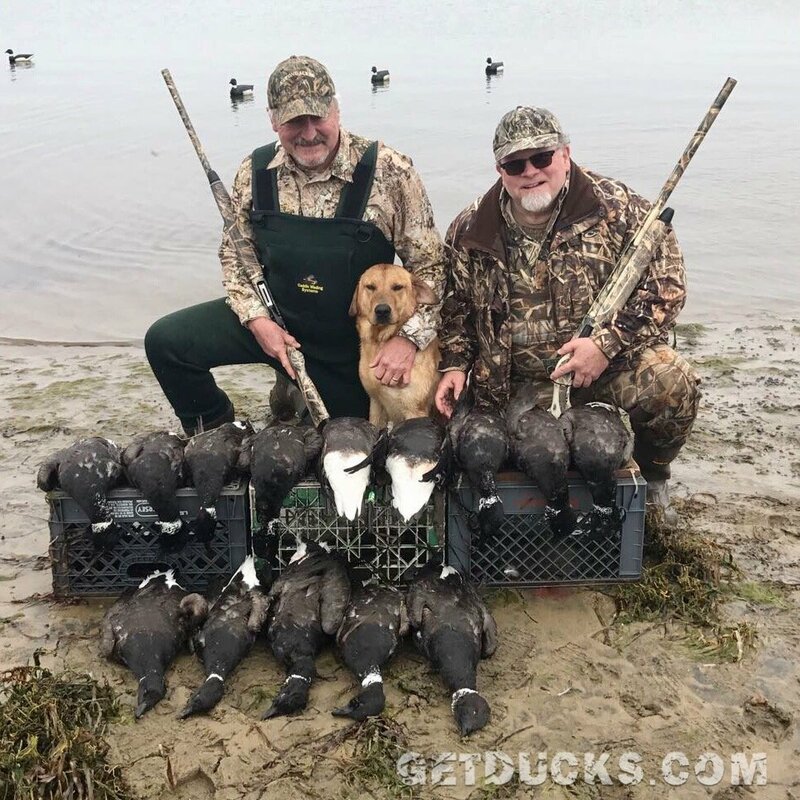 Chest waders are suggested for duck hunters. 12- and 20-gauge Semi-automatics are available FREE for guests choosing to eliminate paperwork. Personal shotguns permits are also included at no charge. The climate in Baja California is temperate and rather dry, receiving an average of 9 inches (235 mm) of rain annually. Expect lows in the mid-40s warming to highs in the mid-60s. Hunters that try to import ammunition without the proper permits discover the ugly consequences. This is a serious criminal offense in Mexico, so don’t dream of trying it. Quality ammunition will be available per the Black Brant Hunting package. Contact us about Hunting Black Brant in Baja Mexico. Outstanding, Ramsey. Want to thank you and Anita for all the help. The brant hunting in Mexico definitely lived up to the hype. My dad and I truly had the hunt of a lifetime. Ramsey Russell GetDucks.com are professional and very knowledgeable. Ran very professional and easy to work with. 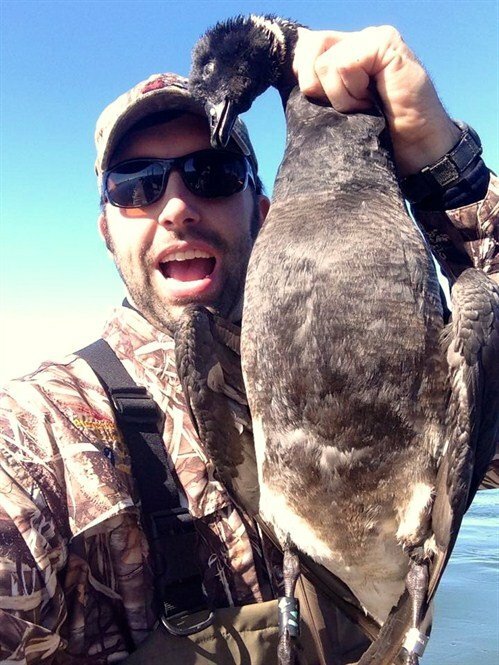 The Baja Mexico brant hunting was excellent. Food, transportation, guides, hunting, hotel, service, and our host were all outstanding. They went out of his way to make sure we all had an amazing experience. The guides moved our location several times to get us in better locations. GetDucks.com is very professional, lots of communication. Ramsey was available anytime and answered all questions I had. Everything was easy. You guys have thought everything out, and included everything we needed. The Baja Mexico brant hunting trip was an outstanding success. I would like to thank Anita and Ramsey at GetDucks.com as well as the field staff. Everyone seemed to be overjoyed and were able to fulfill and exceed their goals and expectations for the trip. I never heard a complaint and everyone is dreaming of hopefully returning to do it again soon. Again thanks for a spectacular hunt and I hope the pictures I attached worked out. It was three days of full limits, bands and we even managed to add some ducks. Had a great time hunting brant in Mexico with my Dad. Lots and lots of birds, with brant limits every day! Lodging, transportation, guides and most importantly the hunting was exceptional! Looking forward to my next trip to Mexico with GetDucks.com! GetDucks.com best booking agent I have ever worked with. GetDucks.com is the best booking agent I have ever worked with. Lots of brant, good blinds, good guides. Enjoyed seeing that many Pacific black brant on their wintering grounds. Things ran smoothly and were efficient on our Mexico Pacific Black Brant hunt. Our host was very good. Food excellent. Guides good and hunting was super for brant. Countryside in bay area was gorgeous each morning and the brant were abundant. I rarely use booking agents because of so many bad experiences but was happy with GetDucks.com during this entire trip! The Mexico Pacific Black Brant hunt was amazing. The Mexico Pacific Black Brant hunt was amazing. I’ll definitely do it again. Hands down the brant hunting in Baja was probably some of the best in the world, and I’ve been hunting them for 6 years now. Twelve guys, 3 days, full limits. One the 2nd day, a lot of bands fell from the sky for everyone. My dad and I dropped 3 doubles and 1 single out of a massive flock of 200-300 brant. Won’t be topping that for awhile. And the food was amazing. I think of GetDucks.com as among the premier waterfowling companies.